Yet this is the story of Bert van Marwijk getting the best out of his team and steadying the ship almost exemplarily – for Saudi standards that is anyway. His persona is arguably precisely what the shattered Saudis required back in 2015. The oft-bored looking Dutchman who comes across like the gentleman Arsène Wenger is sometimes inaccurately portrayed as; a calm(ing) presence with obvious and transforming leadership skills. 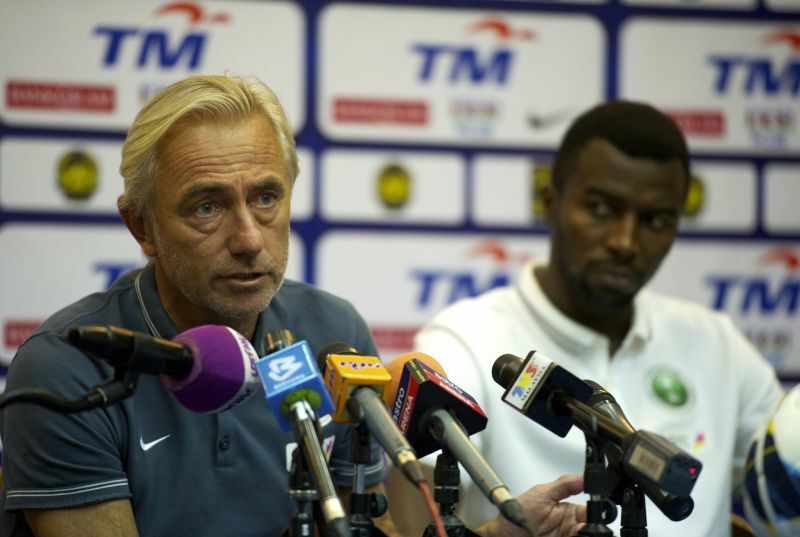 Van Marwijk’s infamous lack of interest in the Saudi domestic scene is of some concern, but given how his team performs, it doesn’t seem as though he’s otherwise neglected his job. Van Marwijk himself is, in a way, the very reason why Saudi progress has somewhat flown under the radar of many Asian football observers. Unassuming, unspoken; it appears that still water indeed runs deep. Where Frank Rijkaard was busy complaining about infrastructure while taking the country to their lowest FIFA ranking ever by insisting on a malfunctioning, goal-shy 4-2-3-1 formation, van Marwijk simply works with what’s on the table; making the most of the material, guaranteeing focus and stability. For a foreigner who had only coached in his home country and neighbouring Germany prior, van Marwijk identified what this team needed as swiftly as was humanely possible. No Al Bassas in central midfield, no Khariri-Al Faraj partnership at the heart of an imbalanced 4-4-2(-ish) formation like at the Asian Cup. From Game 1, virtually at all cost, Bert van Marwijk has stuck with a complex Al Khaibari-Al Faraj-Al Jassim trio in the middle of the park. The rejuvenation of Taisir Al Jassim, in particular, is a success story worth highlighting. Having started getting regular calls soon after the last Saudi World Cup appearance, Al Jassim has accumulated more than 100 caps over a decade, but was used sparsely by Olariou at the Asian Cup, only coming on twice as a sub. He may have been deemed spent on the international level, yet under van Marwijk, he started all 18 qualifiers and acted as a vital cog, often connecting with Al Sahlawi up top, crucially making the lone striker not as isolated as was often the case before. Filling the role of Wesley Sneijder the 2010 World Cup edition ©, and indeed drawing the apt comparison from our friend Wael Jabir long before Saudi Arabia were fancy, we shall probably begin warming people up to the inevitable #AlJassimForBallondOr hashtag, don’t you think? Back in the fold, Al Jassim alone obviously wouldn’t suffice. But since Al Khaibari usually adds tireless legs and a responsible defensive game (though he did struggle a tad in Japan, hence Otayf stepping in for the last qualifier) while Al Faraj, the lanky all-rounder with a touch of justified nonchalance to all he does, connects the remaining dots, the coach feels no need to rotate. Save for rare absences, the starting XI is very much a given. And even the potentially devastating period without both Al Sahlawi and star full-back Al Shahrani at the beginning of this round bore little harm after all. Meanwhile, Bert van Marwijk has had the necessary space to polish his side’s tactical nous to a very sound level, certainly compared to the rest of Asia. Saudis now generally don’t concede fouls in danger areas (Japan and UAE had a single set-piece from around the penalty area combined), look better at defending corners in 2017 than they did earlier when Trent Sainsbury headed one in against them for Australia, and seem comfortable in a highly-centralized attacking setting, where both Al Shehri and Al Abed act like inverted wingers for most of the time and frequently share the same area of the pitch. Nawaf Al Abed is a peculiar case. He had faded away rather dramatically after dragging Saudi Arabia to the 2014 Gulf Cup final and claiming the MVP award. Upon that tournament, KSA arguably became too Al Abed-heavy, letting him lead a vast majority of attacks and not getting nearly enough in return. For much of 2015, Al Abed then looked way too inconsistent – very active, yet very ineffective. Having Naif Hazazi up top didn’t help, but neither did the amount of balls Al Abed was seeing and ultimately wasting. In this qualifying round, Al Abed has been less visible on the face of it, but more of an actual threat. With Al Shehri stepping up to plate, taking up the role of the playmaking dribbler who sometimes tries too hard but also offers a welcome outlet for (vertical) combination, Al Abed has been allowed to take his foot off the gas a little bit, while once again making a difference ever so often. His three early penalties were, crucially, spot on as was his emphatic finish that sealed the UAE debacle in Jeddah – all markings of a composed star player – and his prompt, wonderfully measured assists produced both deciding goals in the tight home wins against Iraq and Japan. Oh, and this? Hard to describe the complex fabulousness of that move. Al Abed’s spatial awareness, the newly acquired ability to quickly react to developments around him and not to lose his head under sudden pressure, should come in handy in Russia, too. That, above all, is what sets him apart from many other talented attacking players on the continent. Unlike, say, Omar Abdulrahman, whom he’s often compared to, the Saudi no. 18 has crucially shown the necessary mental resilience to make his undoubted skill count when scrutiny runs high. And for that, I owe him an apology. I’ve mocked Al Abed a fair bit for the infamous comparisons, but as of now, Amoory is the one looking to emulate, not the other way round. He has proved himself on many levels where Al Abed may be lagging, but really, what other stage matters as much as World Cup qualifiers?